inside workplace wellness: Does Your Organization Have a Glide Path to the Cadillac Tax? Does Your Organization Have a Glide Path to the Cadillac Tax? The ACA expanded health coverage to millions. The Cadillac Tax helps to cover the cost of the expansion by taxing employers that provide "high-cost" health coverage to their employees. AKA -- Excise Tax. 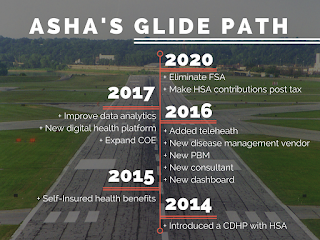 When I was at the World Health Care Congress, I heard big employers like Disney refer to a glide path. They've projected how the tax will impact them and have plans in place that will allow them to limbo under the tax thresholds (more on that later.) FOMO -- I want ASHA to have a glide path too. Isn't there a proposal in Congress to eliminate this tax? Yes, two bills were introduced in the house earlier this year H.R. 879, the Ax the Tax on Middle Class Americans’ Health Plans Act and H.R. 2050 — Middle Class Health Benefits Tax Repeal Act. Nobody I've heard from on either side of the aisle thinks the tax will be repealed though. Feel free to keep your fingers crossed. Why don't the experts think it will be repealed? If you're thinking item four doesn't make sense, you have company. I don't get it either, but I've taken it right out of the Congressional Budget Office March 2015 report. The Cadillac Tax estimate was adjusted down from an estimate of 149 billion in January 2015 because premiums are not expected to rise as much as originally thought. I suspect this is due in part to the changes employers are making in their plan designs, but there is a lot of pressure on cost containment throughout the system right now. The tax goes into effect January 2018, but employers are already restructuring their health care benefit offerings or increasing workers’ deductibles and copays to avoid the tax. SHRM reports that 21 percent of its' members expect to decrease their health benefits offerings in 2015 and 7 percent said they're planning to reduce non-health benefits (such as financial benefits and compensation or retirement savings and planning benefits) for 2015 in response to the pending tax. How do you calculate the tax? The value of coverage is compared to thresholds set in the ACA -- $10,200 for individual coverage and $27,500 for self + other. Any Value over the thresholds is taxed at 40%. There are some proposed adjustments for covered retirees that are at least 55, but not yet medicare eligible; high-risk professions like law enforcement; age and gender (if the age and gender characteristics of an employer's workforce are different from those of the national workforce. There is presently no adjustment for geographic location and that seems like a glaring omission to me. It's something we included in our comment letter to the IRS. State mandates impact the cost of coverage with heavily regulated states like Massachusetts and Maryland above the national average. This would create a double whammy for employers in these states. Those thresholds sound more like a Camry than a Cadillac. Yep, 33 percent of employers are expected to be subject to the tax in 2018. Is it likely that the formula will change before the tax goes into effect? Yes, the IRS just requested comments in Notice 2015-16. I helped to prepare ASHA's comment letter. (Bob Skelton at ASAE submitted a good one too.) It is expected that another IRS notice will be issued in 2016 and followed by another comment period and then the final regulations will be released in 2017. So, what do we think this will cost? For ASHA in 2018, the best case scenario is about $10,000; worst case scenario about $310,000. There will be a COLA adjustment to the tax after 2019, but the picture only gets worse. In 2020, our best case scenario is about $120,000 and the worst case scenario is $750,000. You could drive a truck through the gap in those projections. Is that the best you can do? We have to make a lot of assumptions about the cost of coverage and the choices ASHA staff will make to estimate our tax liability. In the worst case scenario, we assumed a 12 percent trend increase in the cost of coverage, increased the caps on the FSA by 2 percent and the HSA by 5 percent and then assumed the staff currently participating all max out their contributions. When the IRS issues a final ruling on how the tax will be calculated and we get closer to 2018, I can narrow the gap. Either way, that's a lot of mula! What can be done to minimize our potential tax liability? 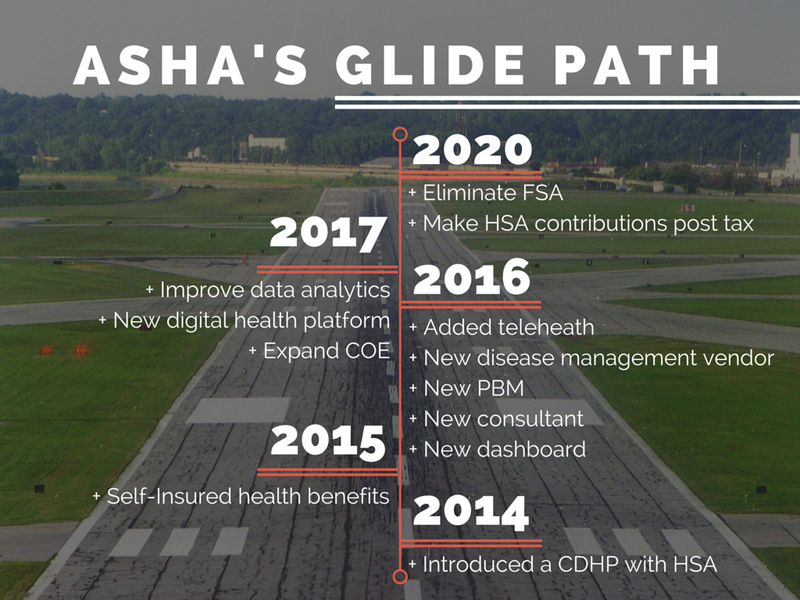 ASHA's taken two big steps already by introducing a Consumer Driven Health Plan (CDHP) and self-insuring our benefits. Employers have lots of options and need to decide what plan of action is right for them. Many options take time to implement, so savvy employers are working on a three year plan now -- their glide path to 2018. To get started developing a list of options for your workplace, I recommend reading this white paper -- What Works in Healthcare Cost Containment -- developed by Aaron Davis and his team at NextLogical. Use the download code mcnichol to access a free copy. Your broker should also be able to help you develop projections. I worked with Mark Sager at Alliant and Zack Pace at CBIZ.